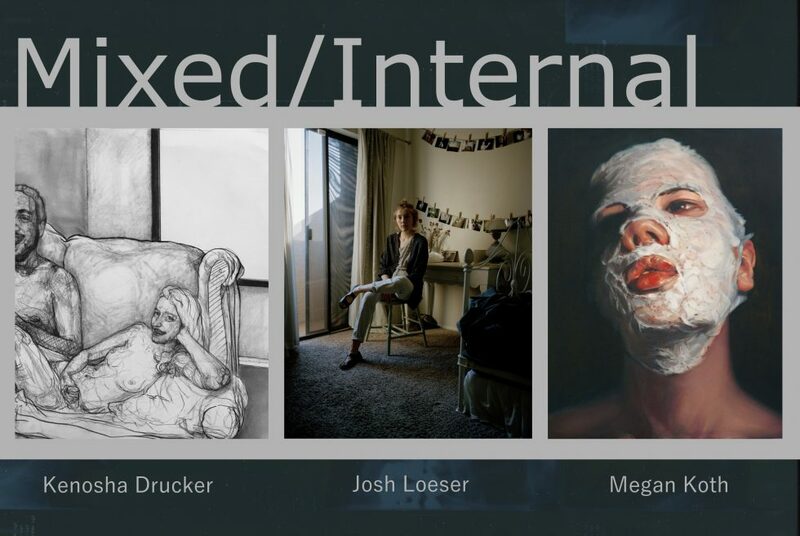 “Mixed/Internal” is a group exhibition featuring work by Kenosha Drucker, Megan Koth, and Josh Loeser. Together, they explore the personal and the sentimental through portraiture and the figure. Through depicting friends, family, or themselves, these three artists reveal their own individual, internal lives. Kenosha Drucker was born to a physicist and a mathematician in Mesa, Arizona. She completed two honors Bachelor of Fine Arts degrees, A Drawing BFA and a Printmaking BFA, at Arizona State University, Barrett the Honors College. Post undergrad, Kenosha continues to expand her skill-set within the arts and beyond. She looks forward to earning her MFA at some point in the future. Kenosha lives in Central Phoenix with her cat Lou, where she manages a vegan restaurant, shows her work locally, and enjoys the good times Phoenix has to offer. Megan Koth graduated from Barrett, the Honors College and the Herberger Institute for Design and the Arts at Arizona State University with a BFA in painting and a minor in business in 2014. Megan’s work is primarily concerned with the self-scrutinization that occurs through gendered beauty rituals. Her work resides in private collections both locally and nationally. She is represented by Art One Gallery in Scottsdale, Arizona. Josh Loeser is a visual artist based in Phoenix, Arizona. He is a native of Phoenix and has lived in the area throughout his life. Josh graduated from Arizona State University in May 2014 with a Bachelor’s of Fine Art in Photography. He primarily focuses on photographing people in his life, and more recently on self-portraiture. Josh has exhibited throughout the Phoenix area and plans to attend graduate school for a Master’s of Fine Art in the future.